If you’re looking for a classic low country fishing experience, consider Therapy Fishing’s species-specific fishing trips targeting redfish. Take on this popular species with one of the best redfish guides in Charleston, SC. You’ll have the chance to reel in one of the most beautiful, great-tasting, and popular gamefish in the area! Also known as the red drum or spot tail bass, the redfish is one of one of the most popular species for anglers because they can be caught year round, inshore and offshore. This beautiful fish has a distinct, deep red body that fades gradually into a white underbelly. These fish usually have two black spots near their tail fin as well. They’re a great catch for beginners, but they also offer a challenge to the most experienced anglers. Redfish are so plentiful and distinct you can try your hand at catching one any time of year, both inshore and offshore. But the best time to go after redfish is in the fall, when the water cools and the larger redfish move into cool, clear, shallow waters. Captain Adam is an experienced Charleston redfish guide. 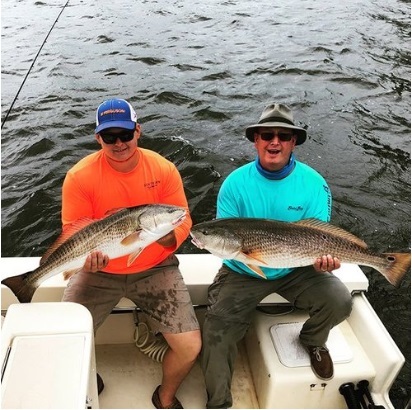 He knows the inshore and offshore waters of the Charleston, SC area well and is experienced in finding the best places to catch redfish depending on the weather and time of year. You may land an average-sized redfish (between 3 to 7 pounds), or if you’re lucky, a real lunker—as adults can range from 20 to 40 pounds! With Therapy Fishing, you don’t have to be a pro or even an experienced angler to enjoy our redfish fishing trips. Captain Adam can provide basic instruction and helpful tips for beginners and novices. And even if you’ve logged many hours on the water, he’ll be able to help you find the hungriest fish and the most challenging catches. Fly Fishing for redfish is popular in the low country because they so often populate shallow waters, marshes, and estuaries. Offshore, however, you’ll likely use either a light spinning tackle or live bait like crab or shrimp. Don’t worry if you’re not sure what to use. We’ll be able to offer advice on the best bait and techniques to use to get you on a redfish quickly. Plus, all equipment is provided! Clearly, redfish are a favorite among Charleston, SC anglers. If you’re open to a great fishing experience going after one of the most popular gamefish in our waters, book a redfish charter with Therapy Fishing today!